Something significant has happened to me a few times now. After a full day, unprocessed feelings can hang over me like a grey cloud. The theme of the conversation in my head often includes some disappointment in myself. I know these negative thoughts dissipate with time, so watching a movie or playing Tetris are helpful diversions. I would like to pray, but the desire to indulge in these numbing pastimes is strong. Inevitably, the next morning when I am clear minded, I can identify the grey cloud of disappointment as a desolation that turns me away from God and the “helpful” solution as a deception. I realize I was deceived by arguments like, “Everyone needs a little fun” or “You’ve worked hard; you deserve a little down time.” Then I resolve not to be tricked again. But by the time evening rolls around, those arguments are quite convincing, and it’s my resolve that dissipates. However, recently I had a different experience. This time when the grey cloud loomed, I had enough resolve left to open a book on prayer. It was Stephen Rossetti’s When the Lion Roars. A few paragraphs in and the cloud was forgotten. My heart instantly filled with the desire to open myself to “the sheer overflowing generosity of God” who wants to be one with me. In a matter of minutes, I was moved from desolation to consolation. It was as if the Holy Spirit turned my gaze from the darkness to the light. Instead of feeling trapped in disappointment, I felt free. I wanted to pray. When I did, God didn’t engage the negative thoughts or feelings. God simply invited me to rest in love. Afterwards when I pondered this quick and palpable change, I recalled two things. When Ignatius of Loyola was convalescing from a battle wound, he asked for something to read. The only book available, besides the Bible, was about the lives of the saints. He would have much rather read about knights and chivalrous heroes, but when he began to read about the saints an odd thing happened. His mood changed. He began to notice that whenever he thought about pursuing honour, pride and riches, he felt down. But when he thought about the saints, he felt joy. At first I wondered skeptically if Ignatius had simply exchanged one way of seeking honour for another, but now I understood. In the saints’ stories, he met God and was loved; that’s what brought him joy. The second thing I recalled was a pivotal moment during a recent prayer retreat. We were invited to meditate on the painting above, “The Procession to Calvary” by Ridolfo Ghirlandaio. 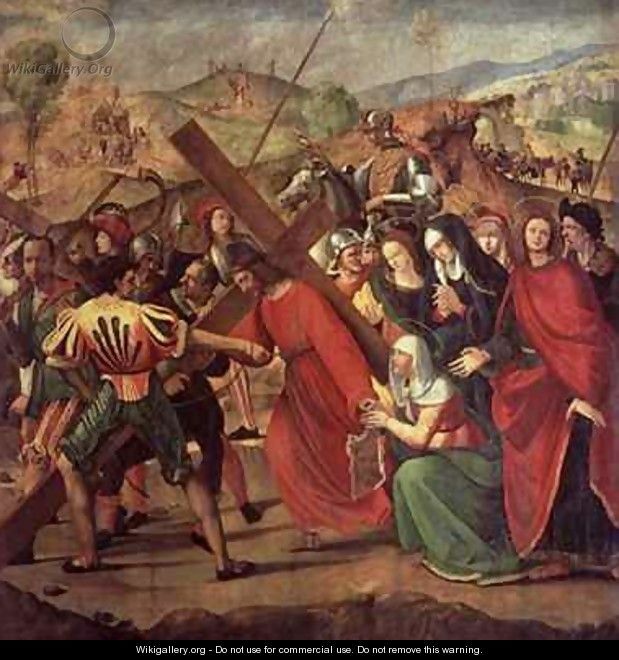 I was drawn to Simon of Cyrene who had his arms around the cross and was ready to lift the heavy load off Jesus. Of all the travellers–soldiers, disciples, women, and onlookers–Simon was closest in proximity to Jesus. If Simon just turned his head, he would be face to face with God. This brought tears to my eyes. This is the amazing thing I learned: God doesn’t always need to unpack and heal what’s under every negative thought I have. Sometimes God chooses to do that, but more often those negative thoughts are like clouds that threaten to rain but never do. In the same sky, God is shining with sheer generosity. I love the fact that the first person Jesus met after he rose from the dead was a woman. I doubt that was by chance. Likewise, the first person he told that he was the Messiah was also a woman (John 4:26). In first century Palestine, women had little status and were considered property, so what Jesus did was a big deal. Love mischief, indeed. “Brooding Sky” by scyrene. Used with permission. “The Resurrection Day” Artist unknown; publisher of Bible Card. From Wikimedia. Used with permission. This entry was posted in Ignatian Spirituality, Reflections, Stories and tagged Blue Skies of Scottsdale, Brooding Sky, consolation, desolation, Dru Bloomfield, Esther Hizsa, Ignatian Spirituality, Ignatius of Loyola, Jesus and Mary, John 20:16, Resurrection Day, Ridolfo Ghirlandaio, scyrene, spiritual deception, spiritual director Burnaby, spiritual director Vancouver, Stephen Rossetti, The Procession to Calvary, When the Lion Roars. Bookmark the permalink. “God doesn’t always need to unpack and heal what’s under every negative thought I have.” Freedom for me there. Thanks, Esther. Thanks so much for sharing this Esther! Such a great tangible reminder of God’s ability to simply blow away the dark looming clouds in our life if only we let go of them and let His Son shine through.